These Brussels Sprouts really satisfy a craving for salty and crunchy. Sautéed with a whole thumb sized piece of fresh ginger, 4 cloves of sliced fresh garlic, a few tablespoons of soy sauce and a sprinkle of brown sugar. They are just what the healthy comfort food doctor ordered. They are high in fiber, antioxidants, folates, vitamin C, A, K and help protect you from cancer. So roast these up and serve yourself a heaping pile of salty, sweet, crunchy brussels. 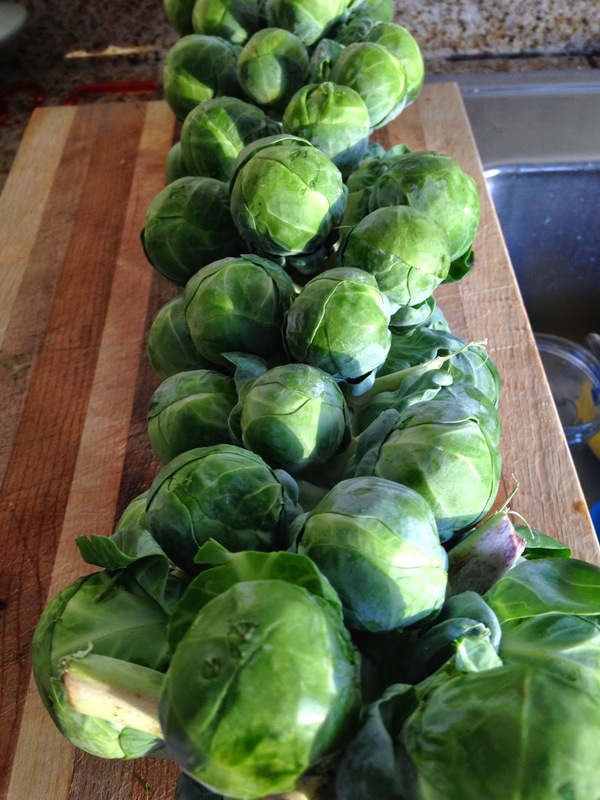 Remove outer leaves of the brussels sprouts, wash well and trim off bottom stem. Let drain. Cut brussels in half. In a large skillet or wok, heat about 2 tablespoons of EVOO. Add brussels to the skillet, stirring occasionally. Meanwhile slice 4 cloves of garlic, and chop up a large, thumb sized piece of peeled fresh ginger. Add them to the skillet. Stirring frequently. Add in the soy sauce and the brown sugar. An optional sprinkle of sesame oil adds a little extra flavor. You can substitute Bragg's for soy sauce. When the brussels have softened, browned slightly and soaked up most of the liquid, transfer to a sheet pan. Roast in the broiler until the outer leaves are brown and crispy. Stirring them frequently.